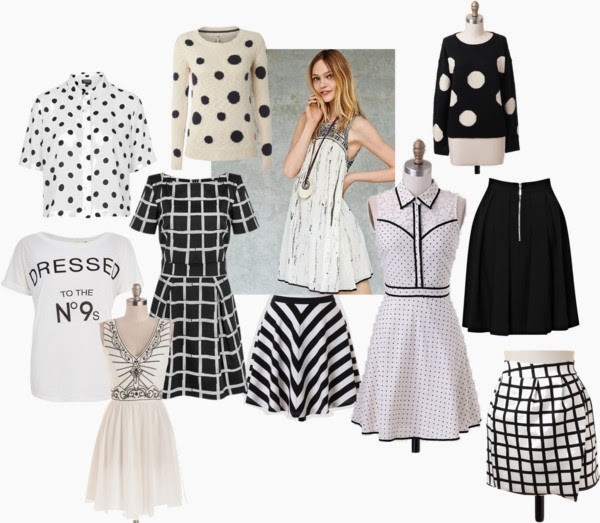 Okay so the first trend is monochrome & graphic prints. This is the trend I struggle with the most...it's definitely the one that is hardest to manage in a wheelchair. Wheelchairs are black, or at least mostly black. So add to that an all white & black outfit & you look like a zebra....black & white all over? I'm hilarious. Seriously though, you end up the same colour as your wheelchair & I think it kind of makes it look like you've merged with the chair & I dunno...I may be paranoid but it's not a look that I think works particularly well. So, listen up. This season graphic prints are HUGE & I think the way I would attempt to wear monochrome this year. You wear a graphic print skirt (or pair of trousers?) & it'll kind of break up the whole wheelchair/person/outfit merge. Then you add a monochrome top & you're set. If you're going for a monochrome dress I recommend one with a white base like these. This years graphic prints are pretty standard - stripes, polka dots, slogan t-shirts & tribal prints. The new things are embellishments & (weirdly) square prints. My favourite monochrome pieces is the white polka dot shirt dress. Obviously the monochrome is bang on trend, the white dress makes it work in the chair, the contrast trim is super cute plus there is that tiny bit of lace which incorporates another trend into the mix... It's a super cute dress. Okay, I know I said no black because it made wheelchairs & their users merge but I LOVE this black midi skirt. Full midi skirts are so on trend & this one is super cute....& when I say super cute I mean a great quality, well shaped basic. Am I the only one who finds that super cute? Whatever, I think this would work with absolutely anything. Lastly, how cute is this slogan t-shirt? I think I'm going to have to get one of these, it'd look amazing tucked into the midi skirt or being worn with the other big trend...pastels.